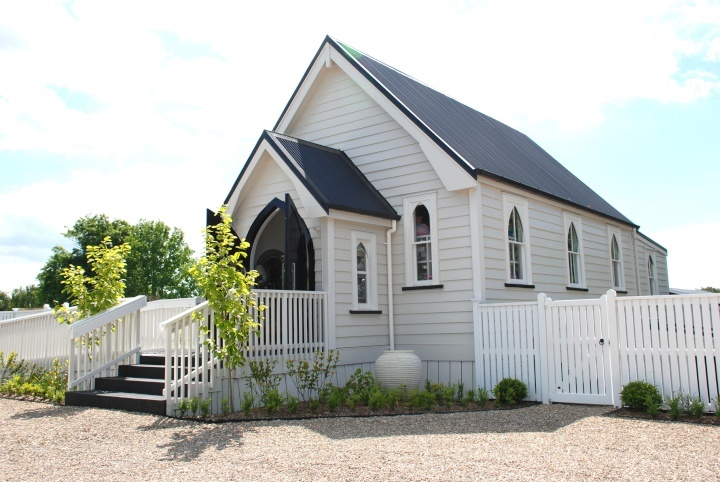 The historic landmark Karaka Church just south of Auckland – converted into a boutique homeware giftshop and adjoining residential dwelling – has been placed on the market for sale. An historic landmark church converted into a boutique homeware giftshop and adjoining residential dwelling has been placed on the market for sale. The split-level Karaka Family Church in Karaka just south of Auckland sits on the main arterial route of State Highway 22 – linking State Highway One with the hinterland Counties townships of Pukekohe, Karaka, Paerata, Waiuku and Awhitu. Originally built at nearby Pokeno in 1890, the Karaka Church was painstakingly transported to its current location by a team of bullocks in 1917. A church hall was added to the rear of the property by dedicated volunteer parishioners in the 1950s. Over the ensuing decades the church hall hosted scores of community events and meetings, Brownies assemblies, Sunday school classes, and ballet lessons, as well as being used by children from the adjacent Karaka School. Karaka Church continued operating as a place of worship by both the Methodist and Presbyterian congregations until 2003 when it was sold into private ownership. 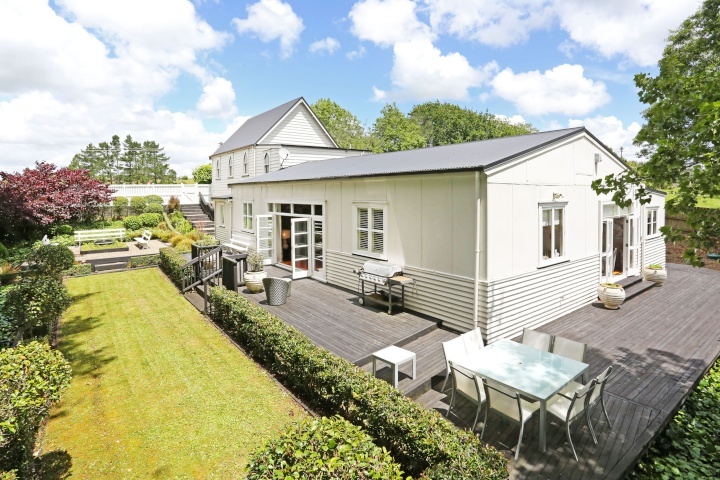 The property was purchased by current owner Rachael Buxton in 2007, and soon after she embarked on an extensive nine-month renovation and landscaping project – retaining as much as of Karaka Church’s original character and façade as possible. The substantial restoration and modernisation project saw the front of the church rebuilt, the roof replaced, the exposed cathedral-style ceiling beams taken back to their native state, the matai floors polished, and the residential component added to what was the hall. The property is now being marketed for sale by negotiation through Bayleys Counties. Salespeople Peter Migounoff and Stefni Baigent said that even though the church could trace its roots back to the late-1800s, there were no Historic Places Trust covenants protecting the structure of the premises or its use. Mr Migounoff said the access points and internal configuration of the property at 458 Karaka Road meant it could be repurposed into a number of uses – ranging from continuing to operate the property under its current status, through to converting the residential component at the rear half of the building into a commercially-run function and hospitality venue. “While the building’s 90 square metre commercial space has housed a retail operation selling homewares and furnishings, the area could easily be converted into a café, art gallery, or offices. Under its current configuration, the commercial space has its own entry, kitchenette and bathroom,” Mr Migounoff said. “Internal and external stairs then connect the upper commercial level of the building to a 330 square metre three-bedroom/two-bathroom residential aspect of the property which features three living areas and an open-plan kitchen. “With appropriate consenting and the installation of a commercial-grade kitchen, the downstairs residential area could be converted for use as a hospitality venue. “With some 110 square metres of wrap-around decking flowing onto flat landscaped and highly-manicured lawns and gardens, the lower level could easily accommodate wedding functions or large private gatherings – benefitting from indoor/outdoor flow through two sets of bi-fold French doors. Ms Baigent said the 420 square metres of church buildings sat on some 1,671 square metres of freehold land zoned residential 9F, which also encompassed car parking for up to 12 vehicles on a gravelled lot at the front of the property. She said substantial additional car parking was available on roadsides in close proximity to the property. “The split-level nature of the premises means it could be purchased by an owner-operator wanting a work-from-home style arrangement, or by an investor who could either occupy the residential dwelling and let out the commercial space or let out both portions of the property to separate mixed-use tenancies,” she said.